I’m from a town in California’s Central (San Joaquin) Valley called Stockton. The Mexican food there is by far, the best I’ve ever had. Seriously authentic and seriously good. I miss it very much. Living in LA, you would think that the Mexican food would be even better but that isn’t the case. They’ve got street food down pat here. The taco truck style tacos and burritos are amazing but when it comes to a real sit down dinner, I am at a loss! I used to have a place for chicken tacos, a place for fish tacos, a place for albondigas… I miss it! People ask me why I feel like it’s so much better there and I suppose it would be because of the agriculture surrounding Stockton. The Central Valley is known for growing food and the Hispanic population has much to do with that. We are talking about generation after generation growing roots in that area. We have restaurants that are 50 years old making the same food for us as they did for our parents. I decided that if I couldn’t find it here I would make it myself. Plus, I’d never made this dish before and thought it might be a good one to add to the repertoire! This is NOT weeknight food. This is food for the love of cooking, the love of flavors, the love of authenticity. This is food for love. 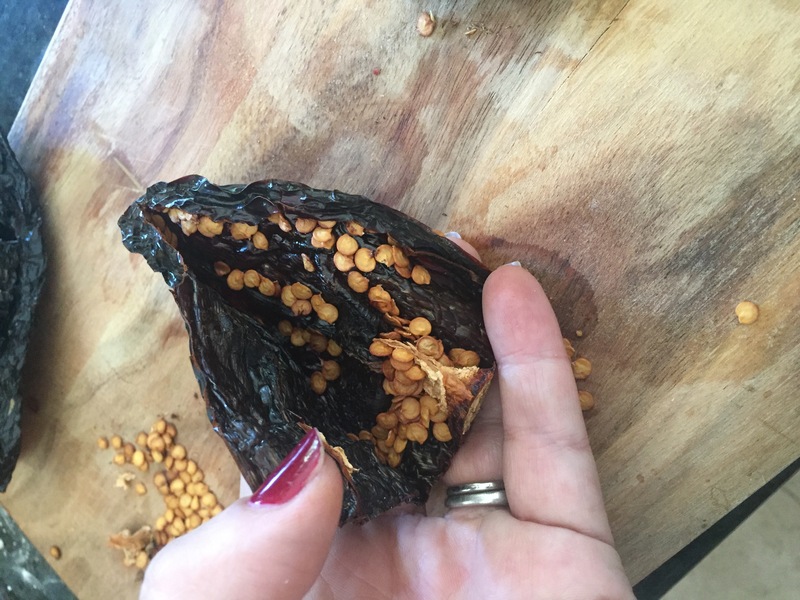 6 dried chilis. 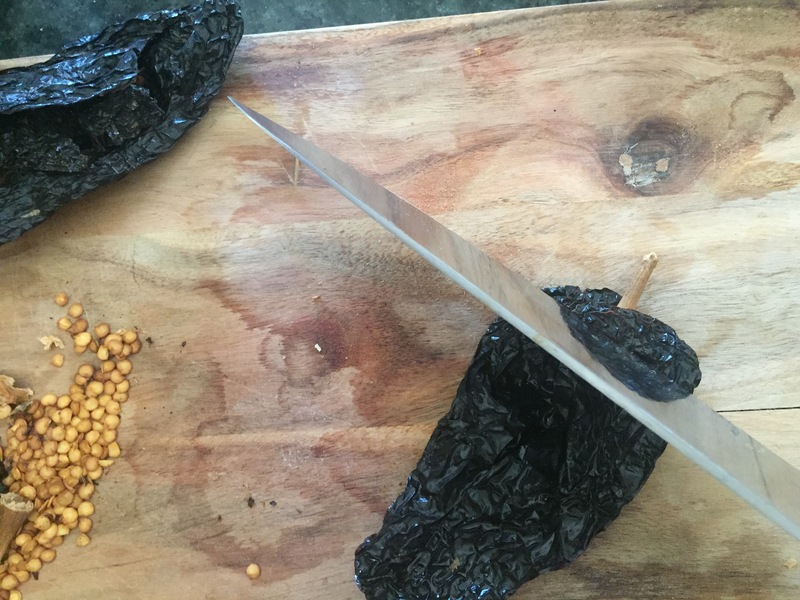 I used 4 ancho and 2 pasillas, stems and seeds removed. You want these to be pliable not brittle. Almost the texture of a firm raisin. If they are crumbly the flavor will be less intense, more bland. 3-5 fresh chilis. Jalapeños would be fine, but I used what was in my garden. 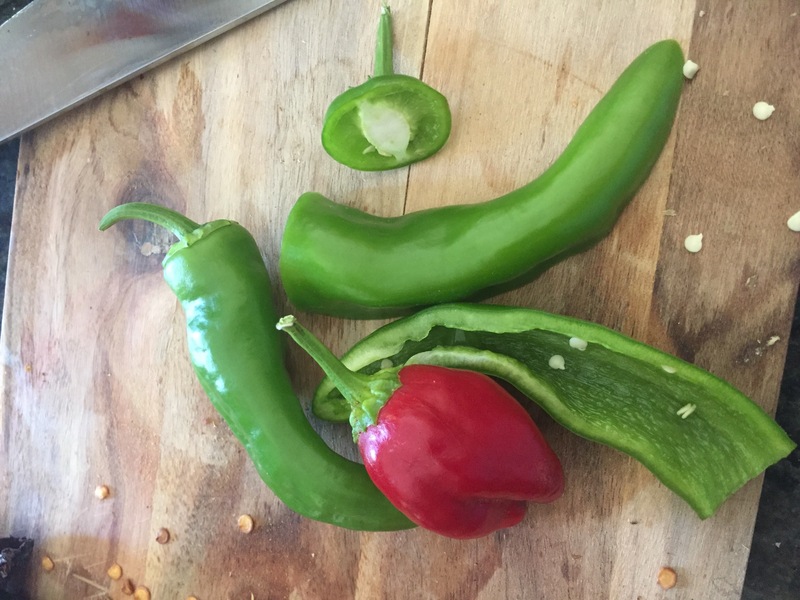 I had a couple small red chilis and a couple Anaheim chilis, stems and seeds removed. 10 cups chicken or vegetable stock. Obviously you’re going to use vegetable stock because you’ve been doing as I say and making your FREE vegetable stock. 1 Tbsp Ground Oregano, Mexican oregano if you have it. In a large bowl place chilis and cover with 3 cups of boiling stock. Cover with plastic wrap and let stand for at least 30 minutes while the dried chilis absorb the stock and become plump again. 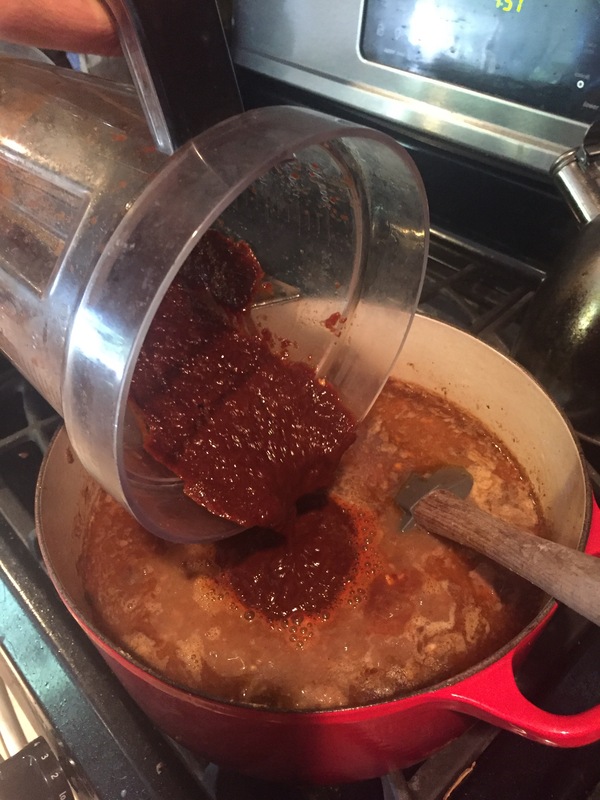 This step is really for the dried chilis but I added the fresh chilis as well, because flavor and… why the hell not? In a large, heavy bottomed pot, add some oil and bring up to heat. 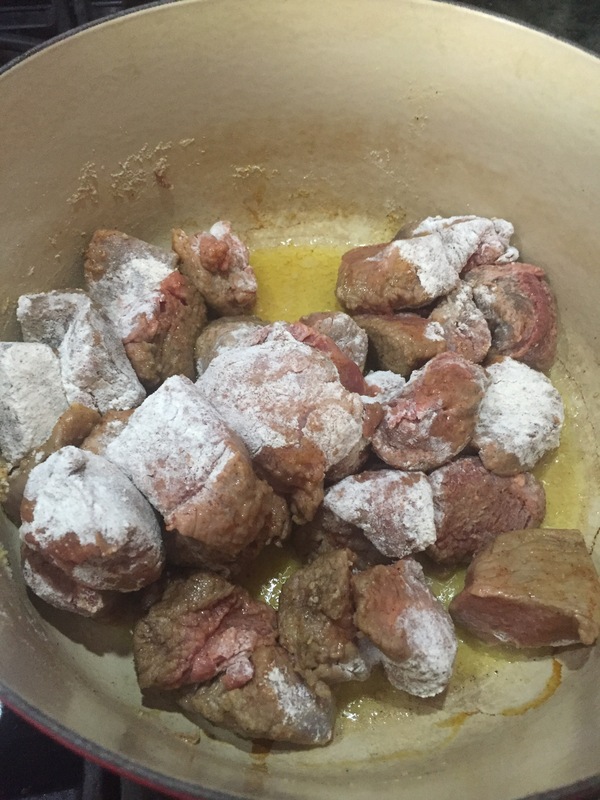 In a bowl, dredge your salted meat in the flour. Toss it around to evenly coat it. Add meat to the oil and brown it on all sides. 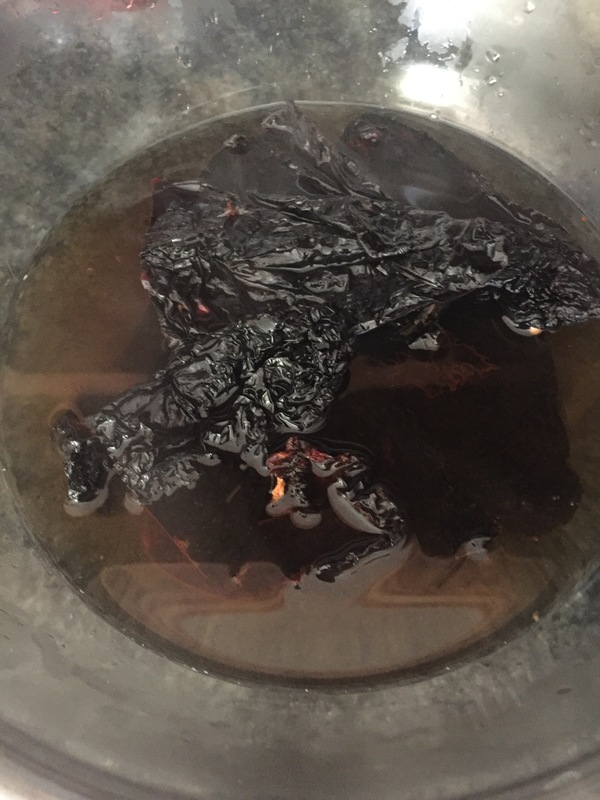 Once browned, cover with remaining stock. Add bay leaves and remaining seasoning. Bring to a boil and reduce heat to a simmer uncovered for an hour. 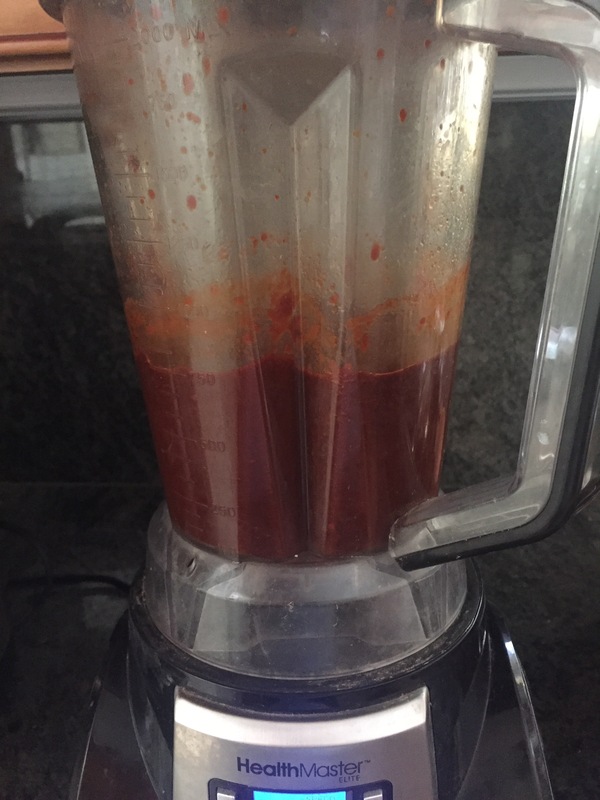 In a blender, add chilis and their soaking liquid. Blend until smooth. This will be a rich dark sauce and will be the magical part of this dish. 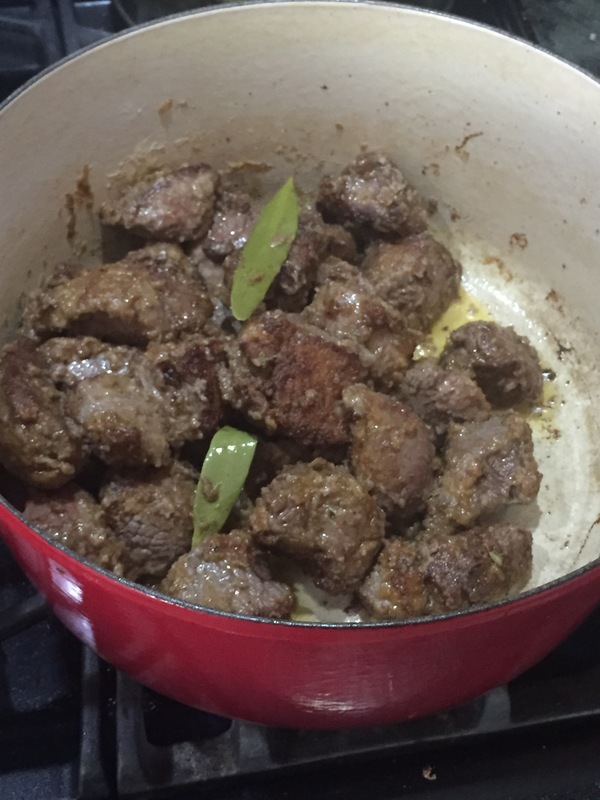 After an hour has passed, add the chili sauce to the pot with the meat, seasonings and stock. Bring to a boil, reduce heat to a simmer and let cook, this time covered for 45 minutes to an hour. 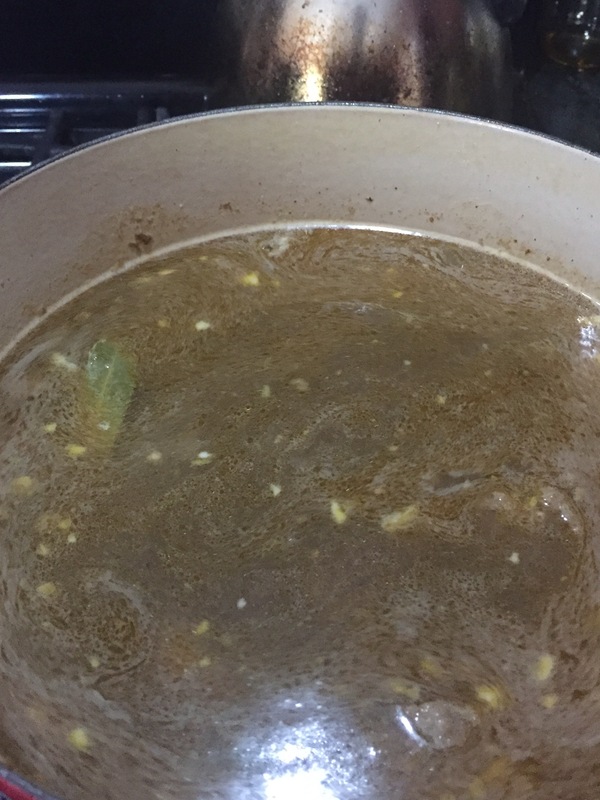 By this time the sauce should be thick, rich and a deep burgundy color. S&P to taste and serve with fresh tortillas, rice, cabbage, whatever makes you happy. This dish is easy but time consuming. It was worth every second I spent on it when The Rockstar said “Babe, this tastes so authentic, I thought you might have a sancho!”. 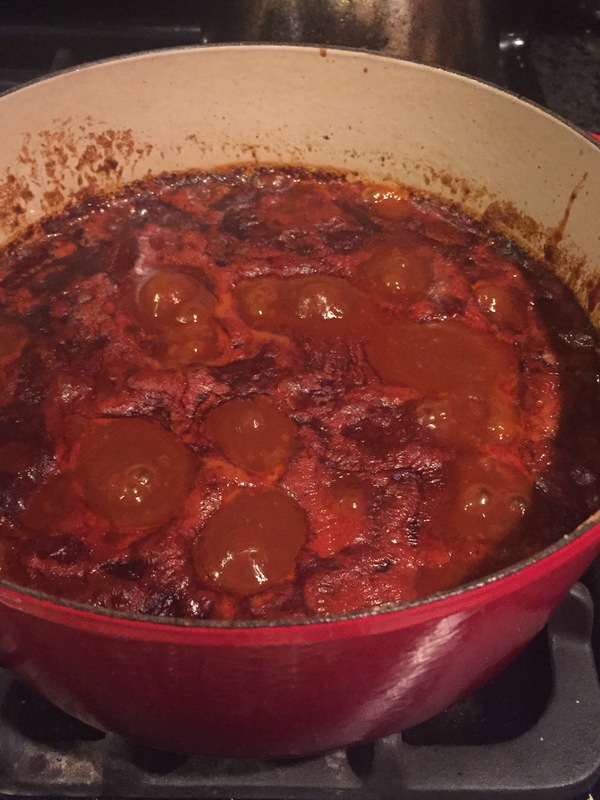 I don’t know how it would compare to your Abuela’s recipe, but I enjoyed it very much, as did my family. I will def be making this again soon. Swearing Mom out. This is Fabulous Jenny-Faye! I love Chili Colorado and have never tried to make it, but now I definitely will. 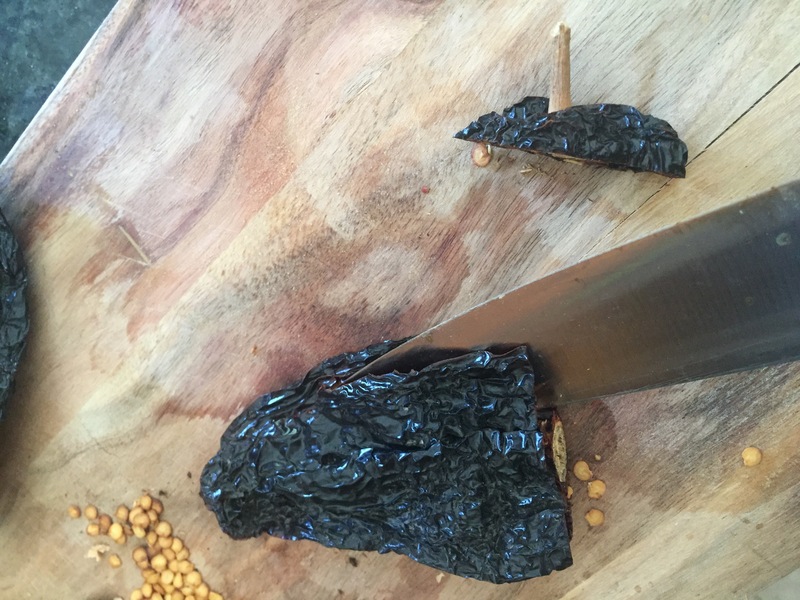 Where do you find semi-dried chiles that are still somewhat flexible? Most of the ones I find in NorCal are fully dried. Thanks! I got these at Von’s. Just touched them through the packaging to make sure. They were a little harder than raisin consistency. They didn’t crumble under the knife at all. That’s so funny! Oppositely, I have found new love for authentic Chinese food down here! Especially dumplings! Have mercy!!! I could eat 20 by myself! What are some of the restaurants in Stockton?